Nothing is quite so hard hitting as just a simple view of the walking dead, and that is exactly what the Walking Dead T-Shirt gives. This shirt features a close-up view of a zombies mangled and blood spattered face, with more zombies not far behind. This garment is a simple yet comfortable black shirt that features the gruesome visage of a zombie on its front. 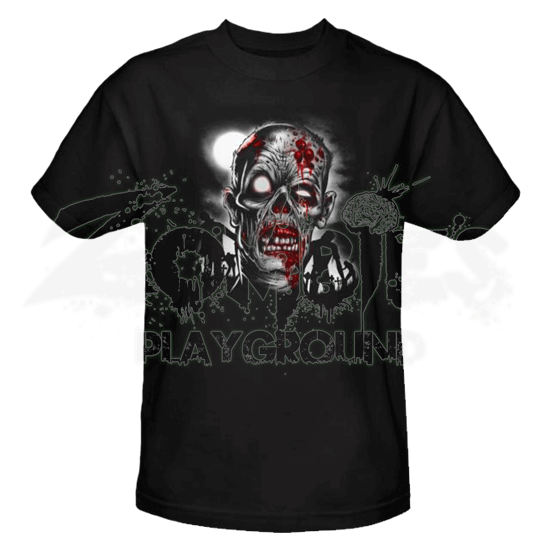 The zombie sits dead center on the chest of the shirt, where its blank white eyes stare out into the world. The zombie has dried gray skin that is covered in various blood spatters. Its lips are pealed back, revealing jagged, flesh-rending teeth, while sores and tears in its skin reveal the bloody meat and tissue that lies just beneath its fragile, necrotic skin. Behind the zombie are the black silhouettes of more walking dead as they rise from their graves, while above the scene is a misty moon, shining pale light onto a scene of nightmarish horror. This impressive shirt is made from 100% quality cotton and is a standard fitting adults t-shirt. It might be a little bloody and gruesome, but that is just how zombies are. 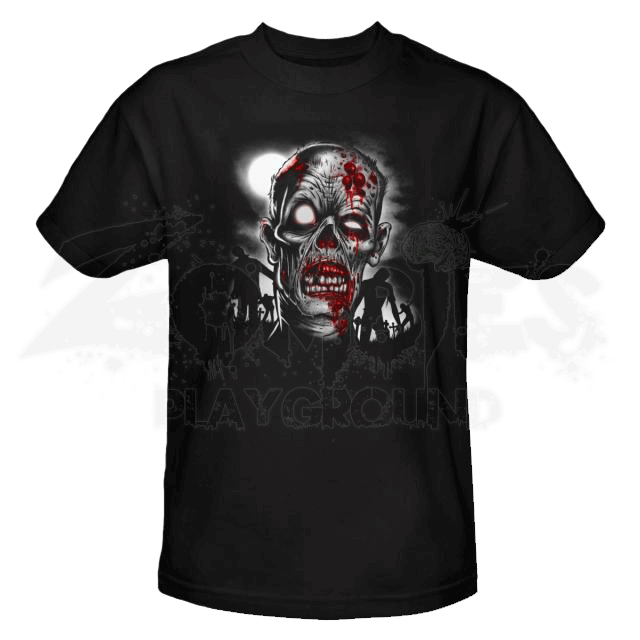 The Walking Dead T-Shirt is a great piece of apparel for any zombie fan to wear every now and again, especially if they do not mind showing people what a real zombie might look like.